FORT MYERS, Fla. — Jon Lester was asked the most standard of spring training questions yesterday. Is there anything in particular he plans to work on? His answer was as quick as his fastball. Lester walked 83 last year, 17 more than in any previous season. He averaged 3.6 walks per nine innings, well above the 2.8 he averaged in 2008 and ’09. Lester doesn’t plan to spend any time trying to figure out why he’s 3-6 with a 4.76 ERA in the 17 career starts he has made before May 1. “In the end of the season, it all comes out in the wash,’’ said Lester. “We’ve tinkered with different things down here. You know what? I’m just going to get ready for April. Whatever happens, happens. I’m going to try and put myself in the best position to win every game I pitch. Lester was 19-9 with a 3.25 ERA last season. He made the All-Star team for the first time and finished fourth in the American League Cy Young voting. Lester had a chance at 20 wins, but he allowed eight runs on nine hits against the White Sox Sept. 30, lasting only four innings in his final start of the season. No making it up Jacoby Ellsbury had only 78 at-bats last season. At the age of 26, he lost a season of development. “When you’re that age, repetition is really good,’’ said manager Terry Francona. 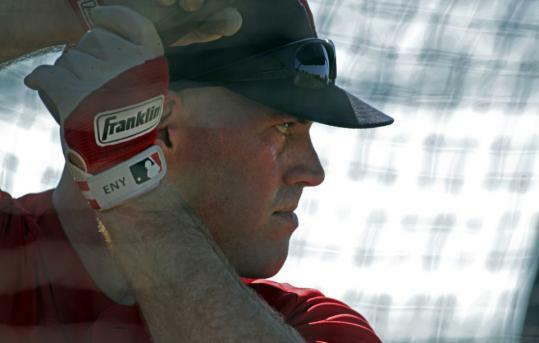 “The 500, 600 at-bats young players get, they generally, if they’re good players, get better. “That’s not going to help. But that doesn’t mean he can’t be a terrific player. Francona said there are no plans to give Ellsbury extra playing time in spring training. Francona said Ellsbury is free to try to steal as many bases as he wants in spring training. There are no restrictions on him. Clean slates Righthanders Brandon Duckworth and Tony Pena Jr. were cleared to throw off the mound after MRIs on their throwing shoulders came back clean. Both had been shut down for a day. “We just wanted to make sure they were able to throw without risk,’’ Francona said . . . Jarrod Saltalamacchia is 6 feet 4 inches, 235 pounds. He’s “a big son of a gun’’ according to Lester. “When he comes out there and says something to you, you listen to what he says,’’ Lester said . . . Former Red Sox pitcher John Smoltz interviewed a number of players for the MLB Network. Lester, Josh Beckett, Clay Buchholz, and John Lackey did theirs as a group . . . Among the prominent players, only Mike Cameron, Carl Crawford, J.D. Drew, Jed Lowrie, David Ortiz, and Marco Scutaro have yet to make an appearance in camp. All are expected today, the report date for position players. The first full-squad workout will be Saturday.